Private Lawrence Nealis was born on the 20th June 1898 at 113 Brighton Street, Govan, he was employed as a shipyard labourer and in 1913 he enlisted with 3rd Royal Scots Fusiliers (Special Reserves) at Glasgow, when enlisting Lawrence lied about his age giving an age of 18 when he had only just turned 15, Lawrence had an older brother also named Lawrence who had died, it is believed the Lawrence used his older brother's birth certificate to enlist. Three month later and still only aged 15 Lawrence enlisted with the Regular Army at Ayr joining the 2nd Battalion of the Argyll and Sutherland Highlanders in December 1913. 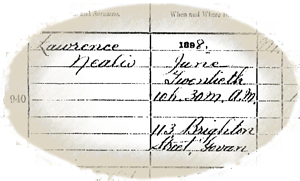 Lawrence's father (also named Lawrence) had died earlier in 1913 and may have been a factor in him enlisting before the war. Lawrence landed at Boulogne, France in August 1914 and by December 1914 the 2nd Bat. of the Argyll and Sutherland Highlanders were attached to the 6th Division reinforcing the hard-pressed British Expeditionary Forces on the Western Front when 16 year old Lawrence was wounded in the hand. On the 25th June 1915 Lawrence had been out getting water bottles filled, when he was shot in the head by a sniper and instantly killed. The Evening Times in July 1915 reported that Lawrence "was only 20 years of age" when he was killed, in reality Lawrence had only turned 17 five days before his death. Lawrence was survived by his mother Mary Nealis (m.s McDowell) of 64 Graham Street, Govan, sister Mary Green of 14 Alma Street, Govan and brother James Joseph who also served in the war with the Connaught Rangers. Private Lawrence Nealis is buried at Ration Farm Military Cemetery, La Chapelle-D'Armentieres, France and was posthumously awarded the British War Medal , Victory Medal and 1914 Star with Mons Clasp. In December 2014 Lawrence's medals (pictured above) were put up for sale at auctioneers Dix Noonan Webb Ltd, the reminiscence group tried to purchase the medals but sadly were outbid by a medal dealer, however the medals were recently put up for sale by this dealer and this time the reminiscence group successfully purchased Lawrence's medals, the group is very happy that they are now back in Govan and are now on display at Fairfield Heritage Centre in Govan. 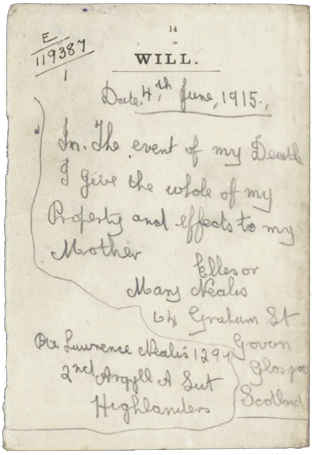 Private Lawrence Nealis' will written in his own hand 3 weeks before his death.